An Exclusive Interview with Catherine Elhoffer on We Love Fine’s New Fall Pieces! 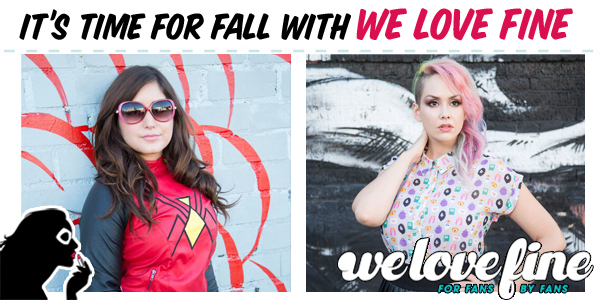 Fall is right around the corner and We Love Fine has us covered with two brand new collections! What Time Is It? is an Adventure Time themed collection filled with cozy sweaters, and the newly released Spider-verse collection has more than enough pieces for the upcoming season. Once again, designer extraordinaire Catherine Elhoffer has answered some of our questions about the lines. We’re over the moon (or space station) for We Love Fine’s newest product release: Star Wars Kimono Dresses! With their bold graphic prints of the iconic Hong Kong and French movie posters, paired with a vibrant contrast trim at the arms and neck, these kimono-style bodice dresses are right at the crossroads of where geek meets chic. Fun and simple, with a fit-and-flare flowy skirt, these dresses will be the perfect piece to add to your summer wardrobe, and ours! Available for sale now at $34. This past Friday marked the start of Star Wars Weekends. 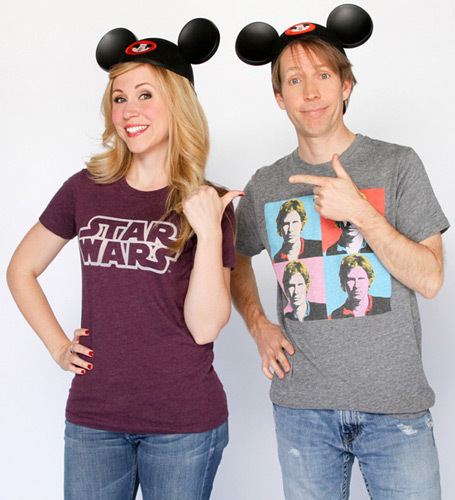 For those of you lucky enough to visit Walt Disney World between now and June 10th, you’ll get to experience shows, meet various Star Wars celebrities, and even eat some tasty treats. Even better, Her Universe released brand new goodies at SWW, but the best part is that they’re available to buy online TODAY!